First modern humans migrated out of Europe and Asia during exodus into Africa. A new paper published by Professor Úlfur Árnason, a neuroscientist at the University of Lund in Sweden, places the last common ancestor of Homo sapiens sapiens and Neanderthals somewhere in Eurasia. 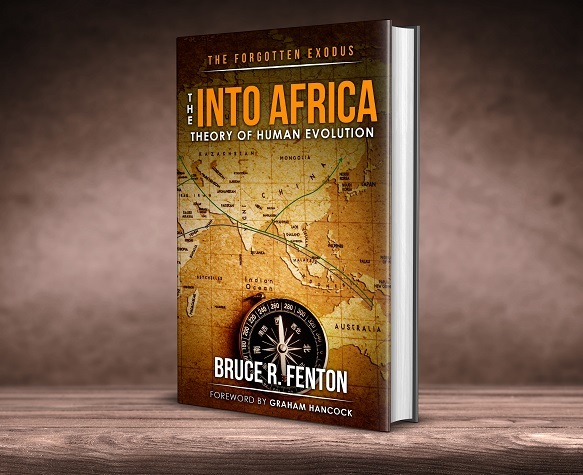 Árnason argues that the ancestors of the African KhoeSan and Mbuti populations formed the first exodus of Homo sapiens sapiens into Africa from Asia and Europe. It is commonly held that the original members of the Homo sapiens species, lived somewhere in Africa and that Homo sapiens sapiens emerged first on the same continent. The majority of scientists believe that only the exact dating of the emergence of our sub-species remains to be resolved. Not so fast, says Professor Árnason, his research suggests that the origination of the Homo sapiens sapiens sub-species was a Eurasian affair. Scientific research suggests that Neanderthals and modern humans parted ways, genetically, sometime earlier than 500,000 years ago. Árnason argues that this date, along with what is known of Neanderthal geographic range, places the first of our own sub-species somewhere in Eurasia. We can boil down the first part of the argument to the fact that Neanderthals are not known to have been in Africa suggesting emergence in Eurasia, if Neanderthals emerged in Eurasia then the ancestral group they diverged away from, archaic Homo Sapiens, should also have been living there. It is a logical argument and one with considerable merit. It is certainly true that Homo erectus, the best candidate for Homo sapiens immediate ancestor, had spread across much of the planet by as early as 1.8 million years ago. There is increasing evidence that the early humans ancestral to both sub-species were already present in Eurasia before the split that gave rise to Neanderthals, Denisovans and Sapiens (Homo sapiens sapiens) and that humans almost identical to those of living populations had emerged in East Asia long before they appeared in the African fossil record. Fossils of seemingly modern humans have been announced by archaeologists working at several Chinese digs, with associated dates ranging from 80,000 to 178,000 years in age. Professor Árnason points to data emerging from the 2016 study The Simons Genome Diversity Project, considered a landmark genetic survey, which suggests that by 200,000 years ago populations of modern humans were already diverging into new genetic groups. This incredible realisation supports a model in which Africans and non-Africans began to part ways, in terms of genetics, close to the date associated with the earliest accepted fossils of modern humans (the 195,000-year-old Omo fossils). It is difficult to understand why two populations in the same region would simply stop mixing for tens of thousands of years, such clean breaks are normally only observed after migration events. Árnason also notes that the deepest divergence was only observed when contrasting the genomes of the Khoesan people and non-Africans. The Simons Genome Project presented evidence of an additional Homo sapiens sapiens divergences involving the Yoruba, a West African population usually posited to be the living descendants of the population responsible for founding all non-African lineages. Two competing models can be extrapolated from the available data, as depicted in the phylogenies trees ‘a’ and ‘b’ shown above (Fig.2). Tree ‘a’ depicts early Homo sapiens emerging in Africa with the three subspecies, Neanderthals, Denisovans and Sapiens subsequently arising on the continent sometime earlier than 500,000 years ago. Neanderthals and Denisovans migrated out from Africa immediately after they diverged from Sapiens leaving no fossil remains and no genetic signature. Hundreds of thousands of years after other humans left Africa the ancestors of the Khoisan and Mbuti diverged away from the ancestors of the Yoruba, close to 200,000 years ago. These African populations then remained separate on the same continent until members of the population ancestral to the Yoruba migrated out of the continent and colonised the planet 70,000 years ago. Model ‘b’ argues that the archaic ancestors of Homo sapiens had reached Eurasia before the divergence of Neanderthals, Denisovans and Sapiens. Neanderthals and Denisovans subsequently remained in Eurasia, never encountering Africans. Around 200,000 years ago, a group of Homo sapiens sapiens broke away from the greater Eurasian population and migrated into Africa, becoming the ancestors of the KhoeSan and the Mbuti. Close to 70,000 years ago a second migration event carried the ancestors of the Yoruba into Africa. The information in Table 1 strongly suggests that there was a significant early period reduction in interbreeding between non-Africans and KhoeSan compared to that between non-Africans and the ancestors of the Mbuti. The same pattern of divergence can be seen in the data for estimates of the Yoruba/KhoeSan and Yoruba/Mbuti interbreeding. When we place this information into the correct context it suggests that the ancestors of the KhoeSan and Mbuti parted ways long before the estimated age, 131,000 YBP, of the 50% coalescence mark. The disparity between the estimated dates for the KhoeSan and Mbuti may indicate two separate migration routes taken from Asia to Africa at somewhat different times. To better illustrate the two favoured routes of the exodus into Africa the map (Fig 3) shows the KhoeSan taking a southern route via the Bab el Mandeb Straights and the Mbuti and Yoruba are taking the Sinai route. The KhoeSan and Mbuti may have taken the same or different routes into Africa, this is not known. The fossils of early modern humans found in China easily fit with the Out of Eurasia and Into Africa hypothesis, explained by the existence of a continuous Homo sapiens sapiens presence in Asia with no requirement for a hypothetical population from Africa that later became extinct. This Out of Eurasia model also readily encompasses the evidence that Neanderthals and Sapiens interbred over 220,000 years ago in Europe, and 130,000 years ago in Siberia, currently problematic for Out of Africa Theory. Thank you very much for publishing this invaluable paper. There are some unbelievable historical evidences from 1,200,000 years ago which show the presence of human beings in the north part of Iran plateau e.g. many evidences recognized in historical caves in former Iranian state of Tajikistan. I would love to know more about the finds in Iran and the neighbouring regions. Very interesting! Path breaking report by Mr.R. Fenton, but needs scientific corroboration and more works in that line. Dept. of History, Sambalpur University, Odisha, India. Sir, you would be surprised at the extent that India influenced the world. The Yamnayas, the first native European group to be Indo-European, possessed DNA from outside indicating their ancestors came in through Iran/India. Their racial features weren’t even white. Airyanem Vaeja is in Kashmir, and that’s 1 of the places humans are shown departing from. Thanks for this, but how relevant is it? 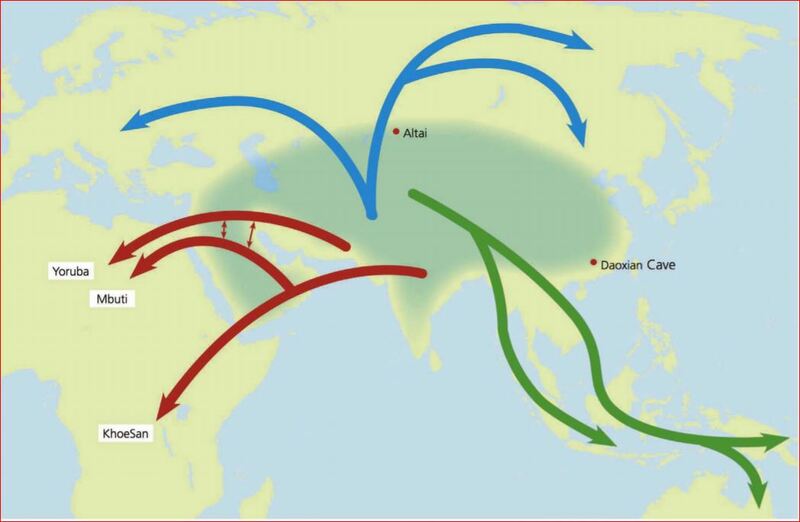 Whether it was Out or Into Africa, Africa-Arabia, Asia or Eurasia or not, is less interesting IMO that how these migrations happened. What amazes me is that in the usual maps we see of H.sapiens, H.erectus etc. migrations, many arrows go straight through the Himalaya or other mountains, although all hominids were strongly water-dependent, eg. google “original econiche Homo”. It doesn’t make a great difference if you live on the Asian side of the Red Sea or on the African side or on both sides. Instead of discussing into or out of continents, it might be more fruitful to try to find out which coasts & rivers early H.sapiens & other Homo populations followed. Human origins will always be of interest to most people, but not all people will find the same parts of the subject exciting. Every change in the narrative is relevant to the complete picture and takes us towards the truth. WIll that truth change society? Perhaps.